Come Join Us and Celebrate Oktoberfest in August 2019! 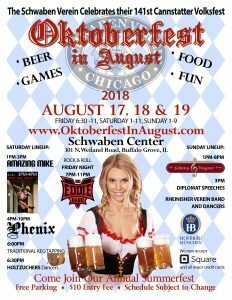 Oktoberfest in August, one of the biggest Chicago area German festivals hosted by the Schwaben Verein of Chicago, a social and charitable club. This is our 142nd Annual Summer Festival. Come celebrate under our Big Party Tent – Open Rain or Shine! Bring your friends, neighbors, family and children to help us celebrate! 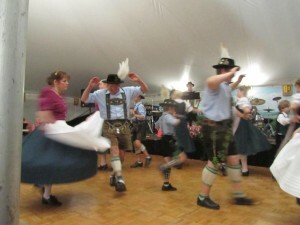 We’ll have German and Domestic beer, bratwurst, good food, live entertainment, singers, dancers, balloon man … fun for all ages! 2019 version is coming soon!!! 7:00 pm – Dancing by American Aid Society, Amozonen and The Rheinische Fanfahren Chor! · 17 and under are free. · Parking and Entertainment is free. · Food and Drinks are available using tickets purchased at our ticket counter. Friday Entertainment: Oktoberfest Pre-Party – The Sting Rays!! 50’s, 60’s & 70’s Classics! We are still in need of a few good folks to help volunteer at this event. If interested, contact us today! All website information is subject to change without notice.